Technology. Entertainment. Design. Red and Black. This in itself defines the essence of our most coveted event TEDxSIBMBengaluru, an independently organised TEDx event. It is scheduled on January 10, 2015 at Symbiosis Institute of Business Management, Electronic City, Phase-1, Bengaluru, India. The theme of the event is Carpe Diem which means “seize the day”. Stalwarts from various fields will be speaking about their area of expertise. The speakers include Gulshan Devaiah (Actor), Urvashi Patole (Biker), Divya Prakash Dubey (Hindi Author), Prateek Sharma (Astrophysicist ), Charukesi Ramadurai (Journalist and Travel Blogger), Sidharth Rajeev (Innovator), Raja Raman (Vedic Maths Guru), Vraj Patel (Mentor and Trainer), Ameen Haque (Storyteller), Elena Kazan (Actress) and Vishwas Mudagal (Author and Entrepreneur). Vasu Dixit (musician) and V Balakrishnan (Theatre Artist) will perform and share their creative ideas with audience. The event has a limited audience seating of 100 and is open to public. It is a full day event commencing from 10 AM till 6 PM. In a world full of uncertainties, Carpe Diem is not just a philosophy; it is about living in the moment, taking that leap of faith, indulging your quirks and swaying with the rhythm. Seize the day, so that when you look back, you smile with satisfaction. Carpe Diem is a call to embark upon a quest. It whispers into one’s ears about the possibilities unknown and not letting the worry of the future spoil your present. It is a beckoning to weave your story into the tapestry of the present. It is about today being the day, now being the moment. 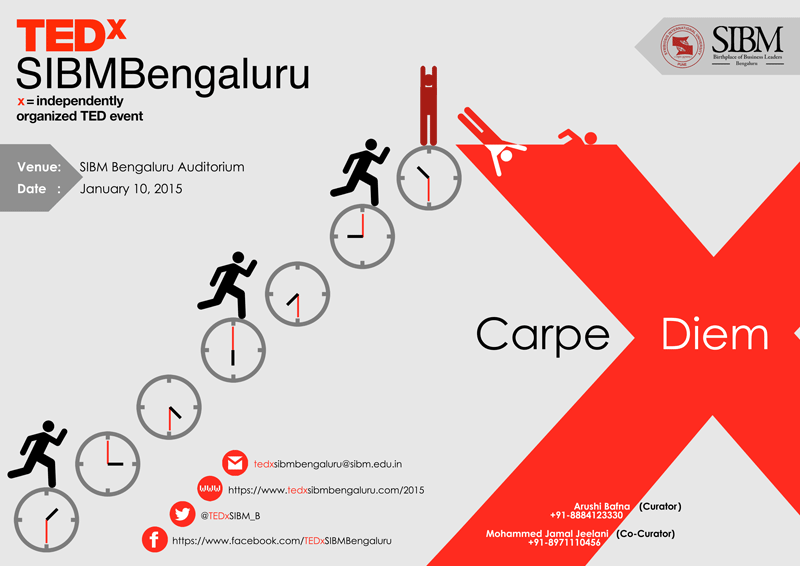 TEDxSIBMBengaluru, entreats you to hold that thought; in your mind and in your heart. Pause: The world is in your hands. Ponder: You can and you will. Plunge: Reach out and take the plunge. Because you only live once, make it count.